Rotatable Digital . Accuracy: ±0, 5 ° C, The probe head is Turnable 180 °. Material: Steel and Plastic. Test range:-50 ° C ~ 300 ° C (-58 ° F ~ 572 ° F). 1 Manual. Wide variety of other uses, including for topping up irons, batteries etc. Can also be used for watering Orchids and other sensitive plants. 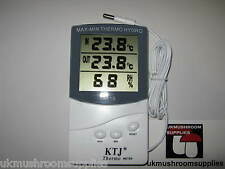 Temperature minimum or maximum and humidity minimum or maximum display using the MAX/MIN switch. Humidity Range: 20% RH to 100% RH. Dual reading for both indoor and outdoor temperature, simultaneously. Frost alarm 3,Products with magnets on the back and hook. Size: 6.7x2.5x1cm. -If the temperature is above 60 ℃, it will display: "HH. This precision stainless steel thermometer is essential for making hard candy, nougat, fudge and more. Simply clamp to side of bowl or pan; the bulb is held securely without touching sides for precise readings. Hangs on rack or stands on shelf. Each unit is also designed so it could be fitted flush in the vivarium or grow box walls. The digital display give a Humidity reading as a RH% and the temperature is displayed in °C. Humidity Accuracy:5%. Thermometer allows you to cook food at the exact recommended temperature Material: Stainless steel Colour: Silver Size: Medium . $Meat Thermometer Instant Read Cooking Digital Food Probe Thermometer for BBQ/Grill | UPGRADED NOW WITH GIFT BOX ---QUICK AND ACCURATE READOUT: High precision temperature sensor response time 2 seconds and you will get a stable reading within 4-5 seconds. ---TALKING THERMOMETER: Press the speaker button to let it speaks the figures out directly, this is very convenient to visually impaired users or in dark. ---LARGE BACKLIGHT LCD DISPLAY: LED light function makes display visible in dark or poorly lit situations. Press the light button when needed and light will auto-shut off after 5s to save battery life. ---LONG STAINLESS PROBE: 4.33in stainless steel probe that keeping your hands away from the heat when cooking at the grill or in the oven. Celsius/ Fahrenheit switchable. Temperature Accuracy: 0.1 Celsius degree(2deg F). LCD display. LCD Display Area: 70 30mm/ 2.76 1.18in. Backstand for easy reading. Color: Black. Battery: 1 AG10. Handheld Portable. Food Tester. LCD Screen. Reasons To Buy From Us. These high levels of radiation can be from inadequate storage of radioactive waste while the high levels of nitrate can be from excessive use of fertilizers. Prestige Meat Thermometer . Small and compact|Ideal for testing the temperature of meat and poultry|Easy to read temperature guide|Handwash only|Quality assurance guarantee . Put on desktop or hang on fridge or Anywhere. Attach to any surface with the stand, hook. Waterproof level: IPX3. in design with easy-to-read at a distance extra-large. Also can easily be added to any BBQ by drilling a hole. Always know exactly what temp your grill is at. FAST AND FREE. 1 YEAR MANUFACTURER. 100-500 degrees fahenheight. Probe Length: 14.5cm/ 5.7" (Approx.). Buttons: ON/OFF, °C/°F, HOLD. Temperature range: -50°C to 300°C or -58°F to 572°F. Data hold function. Material: 304 Stainless Steel & ABS Plastic. Total Length: 24.5cm/ 9.64" (Approx.). The LCD display is clear and easy to read from any angle. Easy to read LCD display. Model 9847N. Dishwasher safe for fast, easy cleaning. 1 year warranty. Celsius/ Fahrenheit switchable. Temperature Accuracy: 0.1 Celsius degree. LCD display. LCD Display Area: 70 30mm/ 2.76 1.18in. Backstand for easy reading. Material: ABS. Battery: 1 AG10. Tala Jam Thermometer . Stainless Steel|40c - 200c|markers to show soft ball, hard ball, caramel,jam etc. .
With the STEP-DOWN probe tip design and LCD display, getting and seeing an accurate temperature is simple. Lastly, if you aren't a pro in the kitchen, we include USDA approved preset temperatures. Probe Length: 6 ½" food grade stainless probe. The CDN ProAccurate® Oven Thermometer is specially designed to measure oven temperatures with precise accuracy, ensuring the best culinary results. Made from durable stainless steel with two-way mounting and a durable laboratory glass lens that resists cracking and breaking, this thermometer is NSF® Certified. 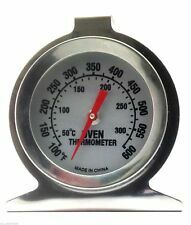 The oven thermometer has a wide temperature range of 150℉ to 550℉ (70℃ to 280℃). In addition to culinary benefits this can also help save energy by ensuring that heat is not wasted by an oven that is too hot. Model: DOT2. 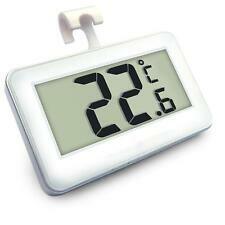 It his has both Celsius and Fahrenheit scale in the display and can, for example, clip on the side of a basin etc. during heating. Handy pan clip will also keep you hands-free during your cheese making! English version. New in unopened box. Bake and roast perfectly, always observing the ideal temperature in your oven. Accuracy /-10 °C. Temperature Range: 50 °C - 300 °C. Green Line: "Niedergartemperatur" = Low Cooking Temperature. An accurate oven temperature is crucial to achieve perfect results of your favorite casserole, roast or baked good. With the CDN's oven thermometer, you can find out exactly how hot your oven gets at a given temperature. The oven thermometer has an easy to read dial and can stand or hang in your oven. The digital display will provide you with a very accurate and clear indication of the temperature in the centre of the food. This very handy device is a must have accessory for the kitchen! Wide variety of uses: Cooking / BBQ / Laboratory / Brewing / Refrigeration.